Welcome to a new regular installment to my blog where I will keep track of all the little tips and tricks that employ to help keep knitting a pleasant endeavor! 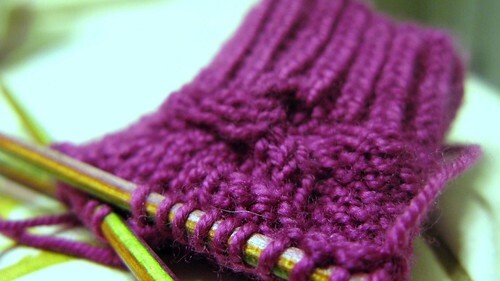 This week’s tip is about working cables on small needles. I try to avoid using a cable needle if at all possible, but I can’t seem to get the hang of cabling without a cable needle when working with sock or lace weight yarn. The stitches just drop too easily. A regular cable needle can also be cumbersome. So, I found what works for me is to use a cable needle that is a DPN one or two sizes smaller than what I’m using. That way the stitches have a little extra room to cross over so that I’m not fighting to work them. Give it a try and let me know what you think! Do you have any cable tricks up your sleeve? Let me know! This bag by Yarn Pop is by far my best purchase at Stitches West this year. I am constantly knitting on the go. With two little ones it’s the only way I would finish anything. I’m so excited for the chance to wait in the pharmacy line, or have an appointment with someone running late because I will have a chance to put a few more stitches on my project. 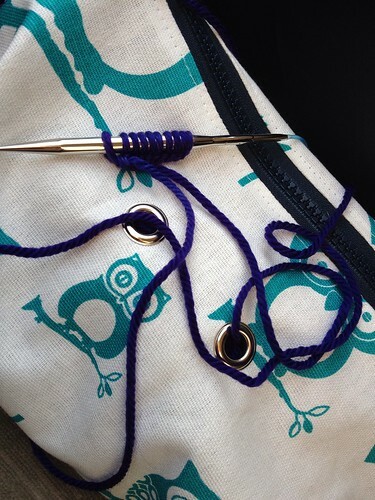 There’s a downside for knitting on the go though, especially if your bag doesn’t cinch up or zipper like this one. I am always missing a DPN, or stitch markers, or find that I have dropped stitches. This bag solves all of those problems. The yarn stays nicely tucked away and the project goes back in the bag, zip it all up with large plastic zipper teeth that won’t hurt or snag the yarn, and voila! Perfectly safe and, not to mention, SUPER cute project back with no missing anythings! 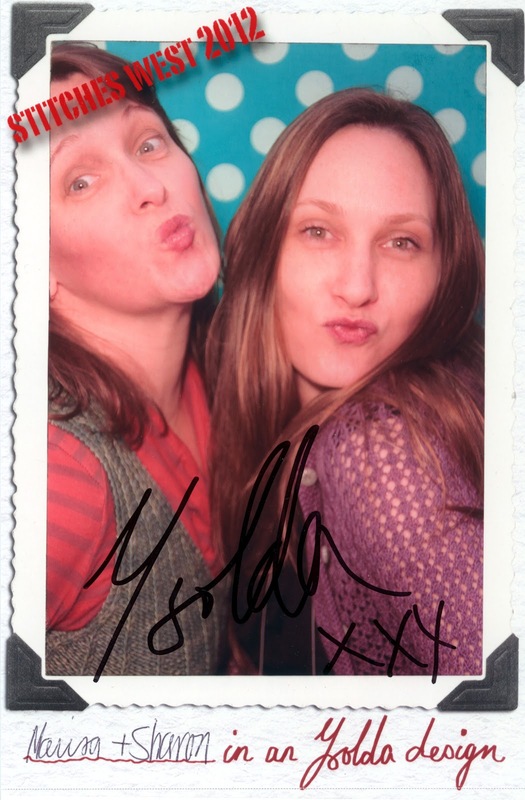 I almost didn’t get this, but I am SO glad I did. I was a little skeptical about the zipper teeth, and I did accidentally zip my yarn, but thankfully, when I unzipped, it came right out with no snags or damage to the yarn. I have put the thunderstorm sweater on hold since it was misbehaving and decided that I needed to do some selfish knitting. 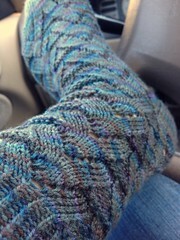 I’m making some cozy, hand knit socks and LOVING every minute of them. I can’t get enough. There is absolutely no worry of second sock syndrome here. The pattern is Monkey, by Cookie A. It is a bit on the expensive side at $6, but I can see myself making this sock several times (which is unheard of in knitting, it takes a special pattern to want to make it more than once). I’ve also had to spend an inordinate amout of time waiting in the doctor’s office and pharmacy (which means knitting time) because my 5 year old has pneumonia 😦 My poor little man, he’s on the mend, but I’m thinking of extra ways to spoil him and make him feel better.